It can take less than 10 seconds for a thief to steal something from your car, and in less than a minute your vehicle could have been stolen. In many cases car crime is opportunistic and low level, but for vehicle owners the crime can spoil a day out, or make a bad day worse! In our experience working with local businesses, schools, retail parks and residential developments in and around Watford, parking barriers are seen as a highly desirable addition to the secure protection of a home or place of business. Opportunistic, low level nuisance crime is still a constant problem for police in Watford. The kind of crime which is described in this way includes graffiti, vandalism, trespass, petty theft, abusive language and threatening behaviour. Many of these offenses are not planned; they tend to be opportunistic, going for easy targets and demonstrating the ability to cause disruption. The typical criminal profile for this kind of crime is teens to mid-twenties, and the ideal locations are car-parks, shopping centres, residential developments and factory centres. Why Protect Your Car-Parking Facilities with Parking Barriers in Watford? Whist automatic barriers in Watford won’t stop all crime; they can provide a level of protection which will be off-putting to the majority of opportunistic criminals. At 1st Choice we provide a range of car-park bollards and barriers which can be fitted either as a manual or automated operation. When fitting car park barriers in Watford, a number of our customers have requested additional CCTV, access systems and alarms in order to ensure a secure environment for employees who may be using the car-park late at night, or early in the morning. 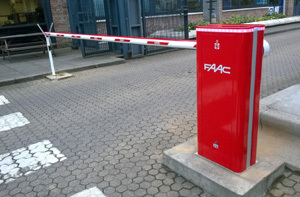 Our security bollards and automatic parking barriers come in a range of colours and materials, and they can be customised to integrate with an existing colour scheme. All our devices are fitted with anti-crush hydraulic devices and hydraulic locks. Why Choose 1st Choice for Your Car Park Barriers in Watford? Our security assessors and installers are interested in providing homes, factories and places of business with an holistic security solution that protects people, property and assets. Our advice and recommendations are based on over a decade of experience in the field, and upon detailed assessments of our customers’ unique operating environment. All our employees are highly qualified and we are committed to ongoing safety, security and customer service training. We’ve built our reputation in Watford on the basis that we care about protecting our customers’ homes, premises and property; let us provide you with peace of mind – and a good night’s sleep! If you are interested in learning more about our car park barriers in watford, contact us today on 0800 118 2414 for an obligation free quote!